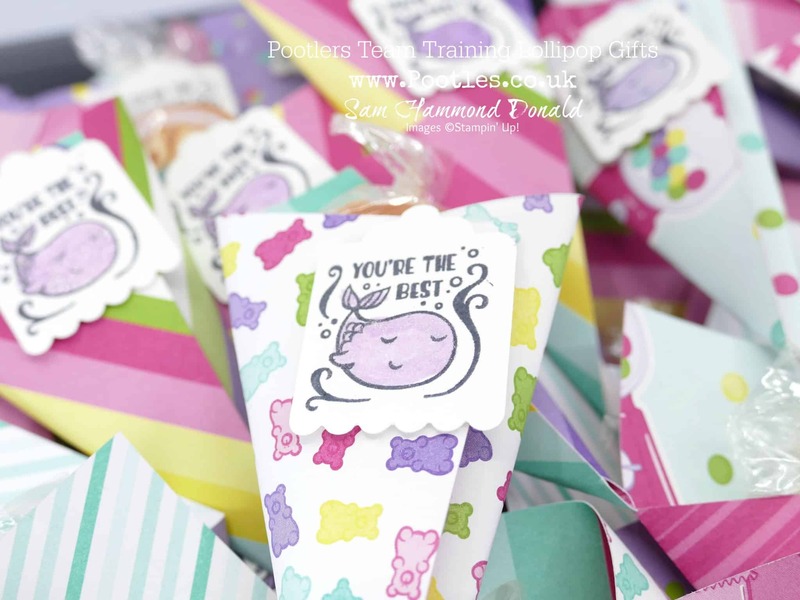 On Monday I showed you the adorable tins that I decorated and filled for my Team Training event this past weekend, well today I’m showing you the little lollipop gifts that I popped inside. We love sweeties at our events and always have a table groaning under the weight of sweets as well as bags and bowls full on each table too. You’d think they wouldn’t need another edible treat for a long time, but we all love a lollipop and I spotted these luxury ones recently and had to create a yummy gift for them. And I made a variation on these for my French team when I flew over there at the beginning of February, so it’s nice to remake a well received gift! These little cones use only 4 x 4″ (10 x 10cm) of paper, meaning you can get 9 out of a single sheet of DSP and therefore for the team this past weekend and the team in France, I used just 10 sheets of paper. Less than a pack! And of course, you can decorate as you want, I kept it simple as I had so many to make for them all as well as various other gifts and treats throughout the entire weekend, oh and the project I trained on too (you’ll see that on Friday), but they’re cute and make great gifts for people of all ages!